When you become a parent you quickly learn that anything a young baby has should be sterile! I mean everything, it is recommended that we even wash their clothes on a 60ºC wash. However it quickly becomes evident that we cannot bring all the equipment to steralise with us where ever we go. Can you imagine if we had to? Well Milton has the answer with their Anti Bacterial Surface Wipes! If you have not yet heard of Milton the brand was born in 1967 when the brands products where first used in the trenches of the First World War to treat skin burns. Once the war had ended Milton became a household brand for use as an antiseptic and disinfectant to name just a few. Come the 1940's when there was an outbreak of gastroenteritis, which caused the deaths of 4,500 babies aged below one. After which Milton developed their cold water steralisation method, saving thousands of babies. Fast forward to today and Milton have a full range of cold water steralisation products for both at home and on the go. 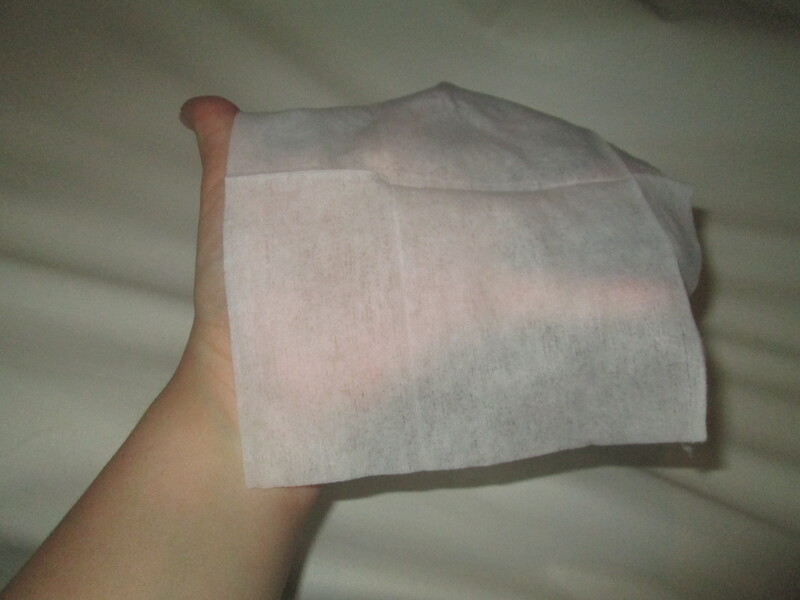 One of the products developed for on the go parents are the Milton Anti Bacterial Surface Wipes which come in a handy wipes packet which contains 30 individual wipes in the small square package pictured above. The Milton Anti Bacterial Surface Wipes are the perfect answer for parents on the go! You can use them to clean everything from tables and changing units (Is it just me who hates using public baby changing units?) to sterilizing dropped dummies and teethers! 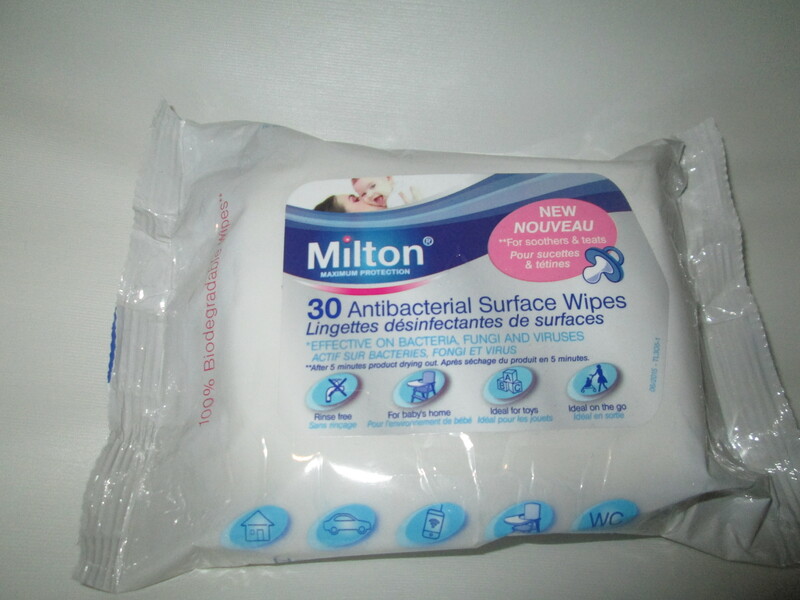 Milton Anti Bacterial Surface Wipes are so easy to use. Simply open the sticky seal which keeps them moist and clean, pullout a wipe(s)depending on how many the task may require (Do use one at a time as I found they go a long way! You can see the size above.) and wipes the object for at least 30 seconds to ensure it is sterile. Allow to dry and Voila! Milton Anti Bacterial Surface Wipes are safe to use on soothers and teats! 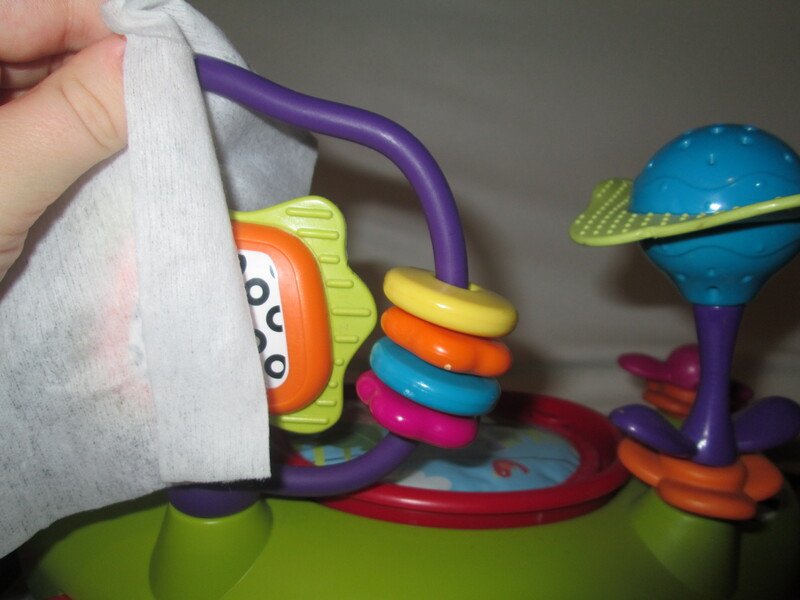 If you are using them on soothers and teats you must remember to allow they wipe to dry out for at least 5 minutes. There's no need to rinse either so they are perfect for at home and on the go. Even better news is that they are bleach free! I think the only issue I have found is that they do have a strong smell but since you use them for such a small amount of time the effect is quite minimal. Baby S doesn't use dummies and we are breast feeding so we wouldn't need to sterilize that equipment on the go but she has started teething. So we end up carrying around almost every teething product we have! When one gets dropped down by accident or hits the floor she will scream. I probably would too! Although we haven't yet dropped one out of the pram it happens regularly at home. I've been using Milton Anti Bacterial Surface Wipes when it happens to enable me to quickly give it back to Baby S with out too much fuss! 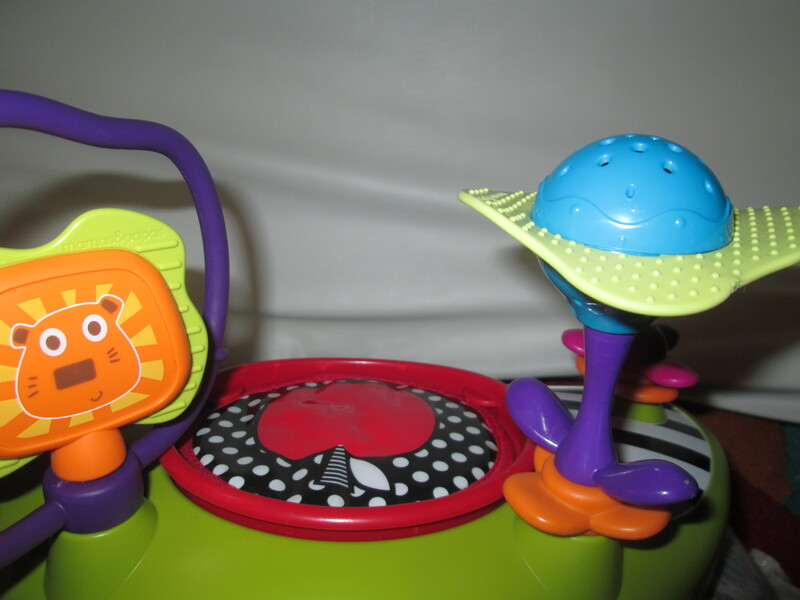 Another use which Milton Anti Bacterial Surface Wipes are perfect for cleaning baby toys. Personally I am a bit iffy when it comes to baby toys, I tend to give them a clean every few days. However Baby S has this toy tray for her seat which I usually use the Milton Anti Bacterial Surface Wipes to clean since it has so many textures and holes etc. Using Milton Anti Bacterial Surface Wipes means I know it is safe for her to shove in her mouth or smother in saliva trying! Once Baby S starts weaning I can see me using Milton Anti Bacterial Surface Wipes to ensure any high chairs are clean where she may be putting her mouth. I may be over-cautious sometimes but I can imagine how many bugs are spread through high chairs in restaurants! A quick 30 second wipe with Milton Anti Bacterial Surface Wipes is simple and easy but very effective! I have loved and I am sure they will become a regular item in our shopping basket. I would certainly recommend to any parents out there or even grand parents and childminders. They are perfect for popping into the changing bag to use when out and even having a pack in your cleaning supplies is so handy! You can purchase your own pack of Milton Anti Bacterial Surface Wipes (£2.05) at Boots. Milton Anti Bacterial Surface Wipes are also available in most major supermarkets, Ocado, Superdrug, Babies R Us, Kiddicare and Precious Little One. Disclaimer: We received the above items in return for an open and honest review. All the opinions expressed above are all my own.